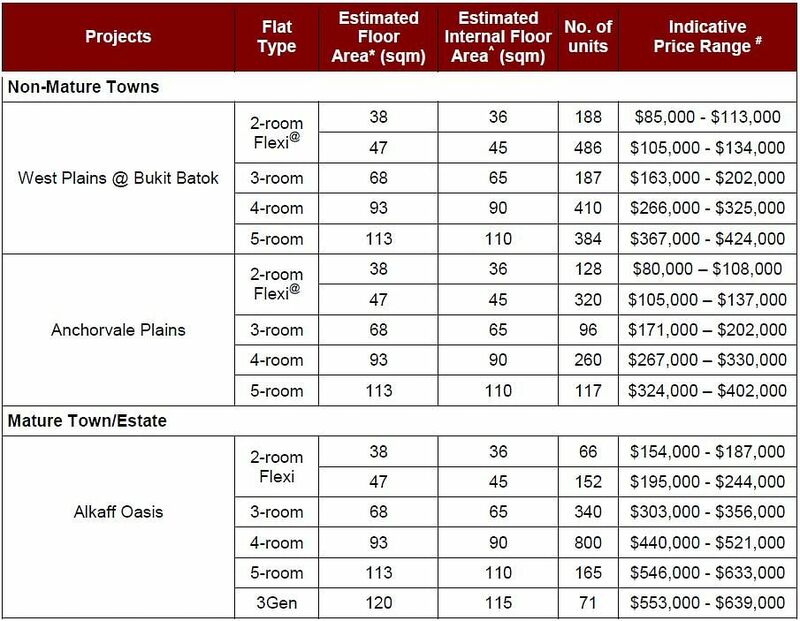 SINGAPORE - The Housing and Development Board (HDB) has launched 4,170 flats in the first Build-to-Order (BTO) exercise of 2016. The crop of flats are from three new projects: West Plains @ Bukit Batok, Alkaff Oasis in Toa Payoh's Bidadari and Anchorvale Plains in Sengkang. A total of 1,594 units will be launched in Alkaff Oasis, which is located in a mature town. West Plains and Anchorvale Plains, both situated in non-mature towns, will have 1,655 and 921 flats respectively. They are the first of 18,000 flats - up from 15,000 in 2015 - that HDB is set to launch this year to accommodate an expected surge in demand. Prices, excluding grants, start from $266,000 for a four-room flat and from $324,000 and $367,00 for a five-room unit in Anchorvale Plains and West Plains. The price of a four- and five-room flat in Alkaff Oasis start from $440,000 and $546,000 respectively. Interested buyers who are eligible can submit their application online via HDB's InfoWeb from Wednesday (Feb 24) to March 1, HDB said in a press release. They can also visit the HDB Hub in Toa Payoh or any of HDB's branches to submit their applications. Flat selection for the exercise will commence in May. Property firm PropNex noted that the launch features a wide range of flats, which will better cater to the diverse needs of buyers. "We foresee flats in Bidadari to be more popular; the higher prices might not deter buyers due to its central location - especially the larger four- and five-room flats. Such larger flats are likely to see application rates of about 5 times. But the overall application rate for the Bidadari BTO project will be about 4 times," said a PropNex spokesman. "As for Sengkang and Bukit Batok, we predict the application rate to be about 2 to 3 times." The last sales exercise in November last year was HDB's largest ever, with over 12,000 flats hitting the market. They included 7,061 BTO flats in Bidadari, Choa Chu Kang, Sengkang, Bukit Batok, Hougang and Punggol, while the remaining 5,350 units were balance flats not sold in previous exercises.